What’s in it? I’m not telling you until you’ve finished it! | Keeps Me Out Of Mischief! What’s in it? I’m not telling you until you’ve finished it! As part of my recent health kick, I’ve been trying to buy some new fruit and vegetables that we’ve not bought before. I love avocado but I’m terrible for doing anything other than sticking it in a salad or using it as a filling in a bagel. This Avocado Chocolate Mousse tricks everyone into thinking they’re eating something really naughty but it’s actually full of good stuff. 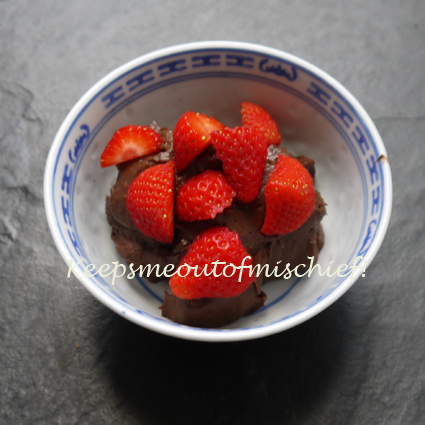 The blog post title comes from my husband who was enjoying his dessert but couldn’t quite believe I was eating chocolate mousse! This is a great dairy free alternative for those of you who can’t use cream in their cooking or who don’t want to use raw eggs to make a mousse. You will need: 3 ripe avocados, 3 tsp of agave syrup, 3tsp cocoa powder. Scrape the flesh from the avocados and place in a blender with the other ingredients and whizz until well combined. Share between 3 dishes and chill for a couple of hours. Simples! « Feeling Rather Proud – My First 5K!